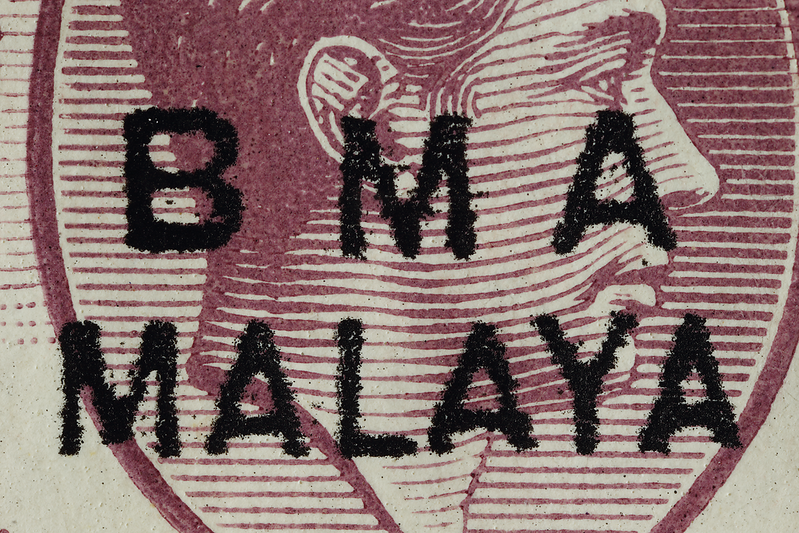 The bma malaya overprint is relatively simple and easy to imitate. 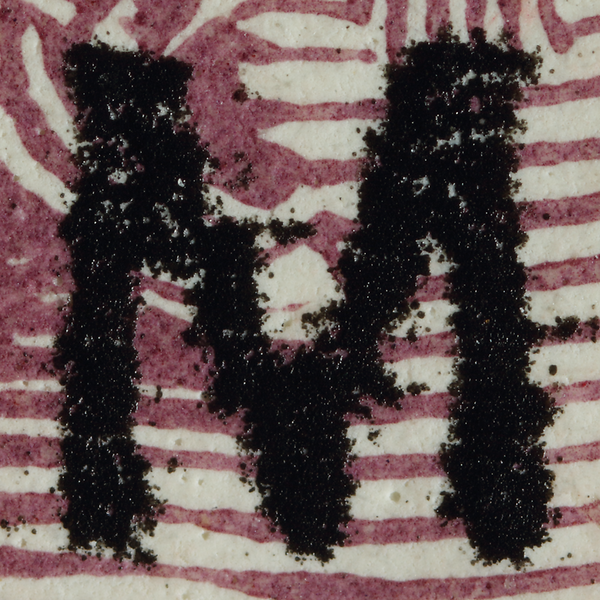 It is one of many such overprints around the world, like those from Hawaii (Hotchner 1999), that have become the playground of forgers. At least six forgeries of the BMA overprints and dies, some rather quirky, have surfaced over the years. They are less of a forensic nightmare than the Japanese occupation overprints. Here is a collection. This forgery of the overprint on the $5 tricolour, of which the author has seen another copy, is plagued not only by terrible print quality and distorted letters with blunt vertices, but also by incriminating box outlines around the letters that may be the edges of individual dies and/or blocks. A few forms of the forgery are described by Gibbons Stamp Monthly (1948) and Wells (1963). One of them is similar to but not exactly this, and another was seemingly cut by hand. Here the postmark is most likely fake as well. 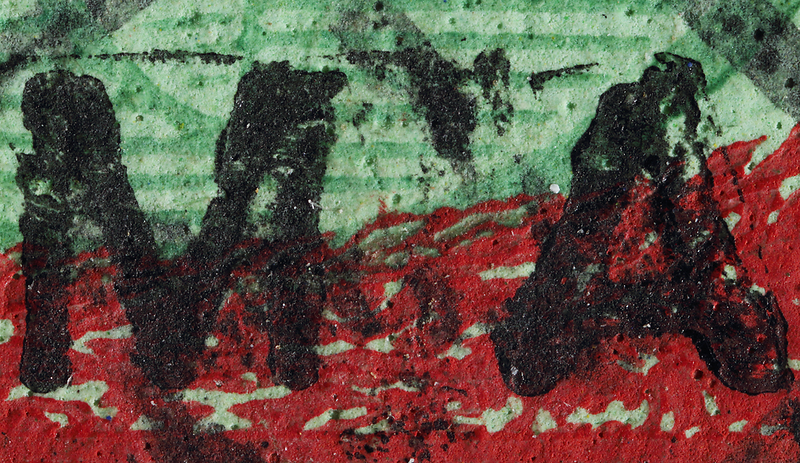 A suspected example of the obscure 'blacking of red overprint' forgery reported by Cameron (1950) on the BMA 15 cents, showing a possible case of chemical change in the red ink with telltale pitting. Lowe (1951) calls it a "dangerous" forgery made by carefully painting over the red overprint, but in my opinion it looks too precise to have been hand-painted. I have encountered only one example despite examining hundreds of copies. A fellow philatelist suggests it could have been the work of a collector whose album lacked the scarcer black overprint, the 50,000 copies of which had sold out by January 1946. This sneaky forgery is difficult, but not impossible, to detect with the naked eye. At high magnification it is obvious an inkjet printer or similar device was involved. 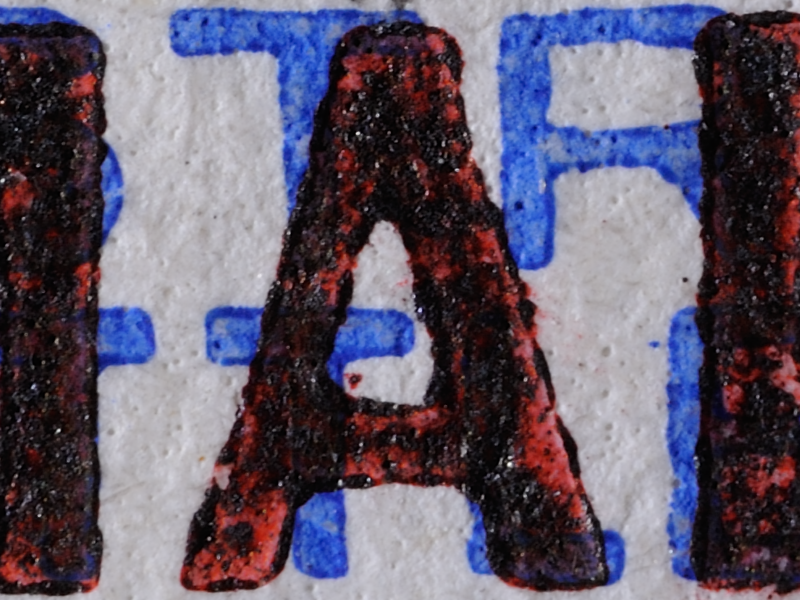 Traces of digital aliasing (step-like diagonal edges) can be seen especially in the last 'A'. 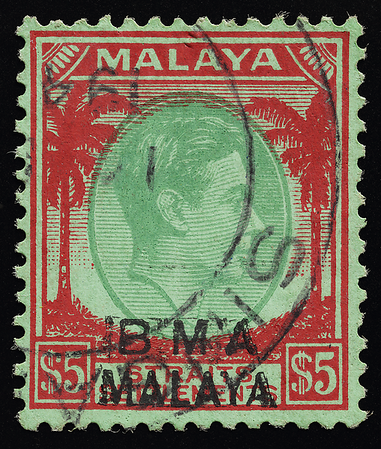 There exists a similar forgery of the TRENGGANU overprint. Meanwhile, someone decided to pull a fast one with double overprints. The forged upper overprint of this stamp is rendered in a typeface of inconsistent weight and crude design. 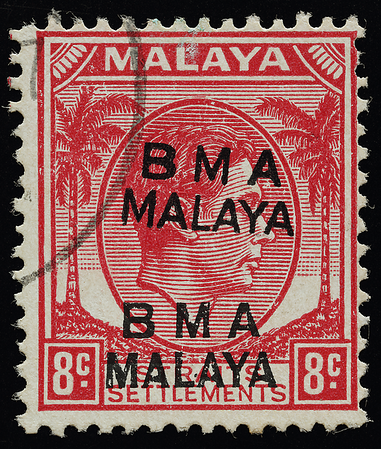 In particular, the forger did not seem to have appreciated that the letters of MALAYA should be of variable within-letter stroke width. Faint score marks have been made in the paper with the help of a straight edge, corresponding with the baseline and cap height of both lines of the fake overprint, presumably to help align the letters being printed individually. It is even possible that the letters were hand-drawn. The overprint is tilted slightly, perhaps in the quest to make it look accidental. The origins of this forgery are unknown. The dealer from whom I acquired this stamp had thought—or appeared to think—it was the famous 25 cents double overprint, and had put a four-figure price tag on it. Eventually I bargained it down to about 5%, not unreasonable for a philatelic curiosity bordering on the outrageous. A forgery of the 25 cents double overprint itself was seen on eBay in early 2018, brought to my attention by a fellow philatelist. This is unlikely to fool anyone though; virtually every example of the genuine error is in safe hands and it is extremely unlikely a copy would appear out of nowhere. 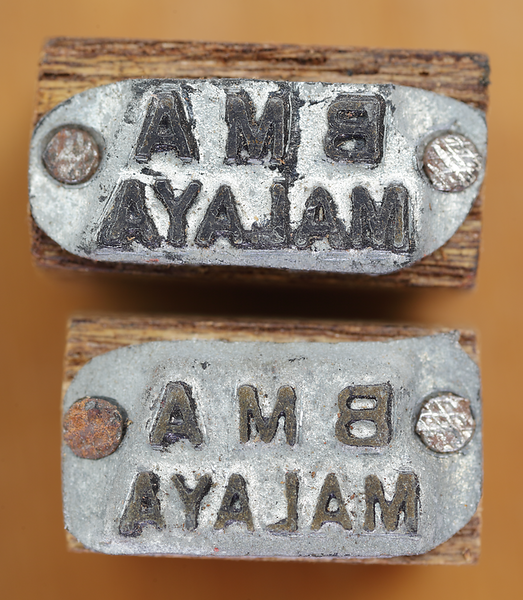 A pair of handstamps with forged bma overprints, different from the ones above, was uncovered by the author in 2018. There are score marks in the base metal around many of the letters, indicating that some fine alignment or adjustment took place. But they're plagued by the usual giveaways—sloppy lettering and blunt corners. One handstamp has heavier font weight than the other; perhaps they were trying to get it just right. See forged handstamps for other counterfeits and the story of the discovery. I thank Axel Magis and Gerald Brown for discussions and reference material that improved this article.